Raffle on the day with great prizes including Mayo Jerseys which will be signed by Mayo Manager James Horan, signed RTE Juniors merchandise and gym membership for the fantastic gym at Mount Falcon Hotel, Ballina. Our aims are to provide resources (both financial and human), communication (in the form of education and communication between parents or parents and the service) and to advocate for our children. To put it simply we are parents helping parents. Geographically the group covers the whole of Mayo supporting any family that contains a child in the service. The children involved must have at least two disabilities, which range from physical to intellectual and from the slight to the profound. We are working to the ethos of inclusion for all, ensuring ALL areas of the community are included no matter if families live in the urban centres or the smallest rural villages and regardless of financial situation. 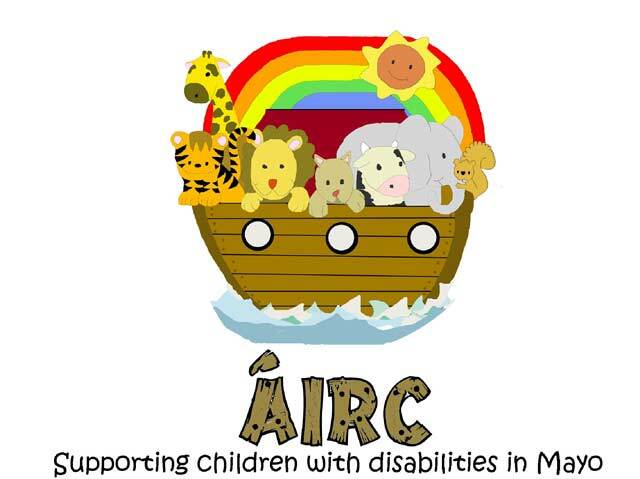 We provide a newsletter for parents 4 times a year updating them of activities and services in the Mayo area that are specific to both families in general and families with a disabled child. Eventually we hope to produce a more visually impressive newsletter and include a more diverse range of information ranging from reviews of family friendly days out to new therapies available. We also hope (funding permitting) to create a website with a forum so that parents can access the great resource that is combined parental knowledge and experience. Two members of the ÁIRC committee sit on the monthly governance board for the Mayo Early Intervention Services to provide a voice for the families. This ensures that all decisions are made with parental input and insight. It also means that should a parent have any concerns that they are brought to the decision makers in the service. Most counties do not have this system in place and it is something that we are quite proud of in Mayo. In some respects this is perhaps our most important function. We provide support in as many ways possible. Support between parents has a multi-facetted benefit including sharing the pool of knowledge and providing emotional support. We try to facilitate this by providing social platforms in the form of family days out and workshops. Our upcoming events include an Easter Party for all families and several pub quizzes around the county for the adults. Many parents of children worry more about their own abilities as the carer of a child with certain challenges and it is to this end that we also run workshops and courses to expand our skill set. We hope to run first aid course shortly that is specific to children with special needs. In the past we have run a children's reflexology course as many of the children would have difficulties relaxing muscles leading to a variety of problems. We also hosted an Inclusion Ireland conference recently to teach parents about the legal rights of people with disabilities. We try to combine fundraising with our other aims when possible. At Christmas 2010 our calendar appeal was very successful and helped us to raise awareness of children with disabilities in a fresh way. The calendar featured children with a plethora of conditions doing regular day to day activities. We wanted people to realise that these children are like any other but sometimes have to do things in a slightly different way. The appeal helped us get out and about meeting and talking to people. We also have run many collections, salsa nights and quiz nights. A major reason for fundraising is to provide nurses and home carers for the children to give their parents some respite. It might just provide a nurse for a weekend so parents can go away for an anniversary. It is a simple thing but helps to keep families together and lets the parents relax. The importance of this cannot be stressed enough. Currently we are fundraising to provide assistive technology for children including trackball computer mice for children who have poor fine motor skills and "switch" devices. Also we have subsidised equipment such as tricycles for children with conditions such as cerebral palsy that have difficulty getting around their environment. We try to spend our funds as wisely as possible and tend to concentrate on items that provide the greatest independence for children whilst incurring the least cost.